Is attention equal across media? What unites a massive poster and a tiny mobile ad, a pop up ad and a cinema showpiece? They are all competing for your attention. But are they equally good at it? This week, we have published two piece of research that address is this question in different ways. On Thursday, we spoke at the FEPE conference with our friends from JC Decaux. We have been working with them to understand the relative impact of out-of-home, desktop display and mobile advertising. 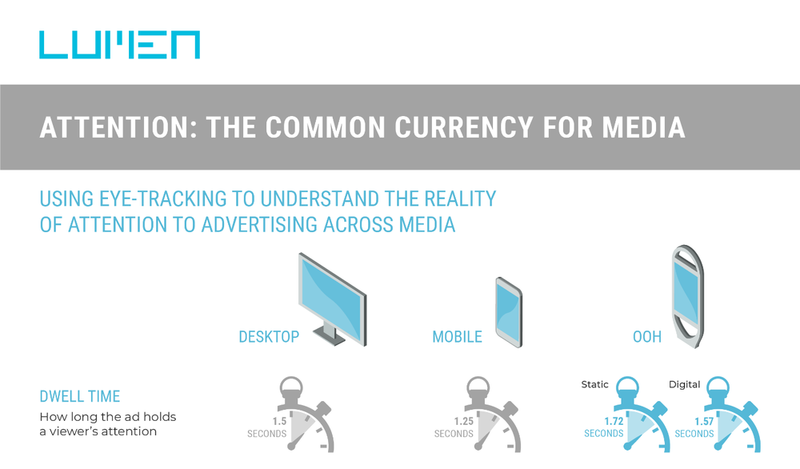 Instead of just applying the same viewability metrics across media, we have gone further, and conducted eye tracking tests across all three media to understand the ‘real reach’ of each. You can download the paper here. One of the most interesting findings is about the relative dwell time with advertising across media. Loyal followers of Lumen will know that because dwell times with advertising are so short, we often advise our print and digital clients to ‘think like a poster’. This research confirms this finding in spades: advertising in all formats has more to learn from poster design than direct marketing. The day before, we launched our ‘attention CPM’ initiative with Brightfish, the Belgian cinema marketing agency. They had conducted some eye tracking on TV and Cinema ads with a local supplier and wanted to compare their results to our data on print and digital advertising in the UK. Working with local media agencies, they have gone one step further, and started to put a price on the attention that different media produce – a cost per thousand seconds of attention, or ‘aCPM’. When you look at how different channels produce attention to advertising, cheap media starts to look very expensive, and ‘expensive’ media starts to look like a bargain. They have even put together a handy ‘cost of attention’ calculator, which you can play around with here. This is an approach that we have been championing within digital media for some time. If you want to buy attention, rather than just impressions, then check out our friends and partners Avocet and Parsec, or get in touch with us direct.